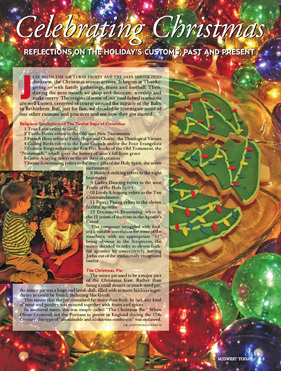 We look at the origins of some of our favorite holiday traditions. Just when the air turns frosty and the days shrink into darkness, the Christmas season arrives. It begins at Thanks-giving — with family gatherings, feasts and football. Then, during the next month we shop and decorate, worship and make merry. The origins of some of our established traditions are well known, centered of course around the miracle of the Baby in Bethlehem. But, just for fun, we decided to investigate some of our other customs and practices and see how they got started. The composer struggled with finding a suitable correlation for some of the numbers; with no appropriate “11” being obvious in the Scriptures, the writer decided to refer to eleven faithful apostles by conveniently leaving Judas out of the traditionally recognized twelve. The mince pie used to be a major part of the Christmas feast. Rather than being a small dessert or snack-sized pie, the mince pie was a huge and lavish dish, filled with as many luscious ingredients as could be found, including blackbirds. This meant that the pie contained far more than fruit. In fact, any kind of meat and poultry was minced together with fruits and spices. In medieval times, this was simply called “The Christmas Pie.” When Oliver Cromwell led the Puritans to power in England during the 17th Century, this type of “abominable and idolatrous confection” was outlawed. But, as with other Christmas traditions during Cromwell’s reign, it went underground. The Christmas Pie became a round, traditional pie and was called a Minc’d Pie, so as to avoid prosecution. After Cromwell’s regime was removed in 1660, the Minc’d Pies remained in their new form, growing larger and more lavish. It wasn’t until the 19th Century that the mincemeat was gradually omitted and replaced with suet, nuts, fruits, spices and syrup. Bizarrely, this concoction was still referred to as mincemeat, in reference to the origins of the dish. So next time you see a blackbird, consider how they used to be one of the favored eating birds of Christmas, and how lucky we are the tradition has passed. The early Christmas trees were lighted with candles, hung on the branches like ornaments. But the candles were a fire hazard and buckets of water were usually kept nearby. Home electric lighting of Christmas trees was not truly practical until 1903, when General Electric first offered pre-wired lighting outfits, complete with miniature Edison lamps, for sale to the general public. Ge packaged their light bulbs with a festoon made by the American Ever Ready company in an attractive wooden box, complete with decorating instructions. Electricity was still a bit of a novelty, and the sight of a glowing electric tree was a wondrous one indeed. But the cost was quite prohibitive — a short string costing as much as $12, which was the equivalent to about $300 today. So the general population was content to stay with their time honored candles for holiday cheer through the 1930s and the war year. In 1945, Sylvania marketed fluorescent Christmas tree lights — a passing fad since they weren’t very bright. In the mid 1940s, the country was introduced to bubble lights. These consisted of a liquid filled colored tube on top of a light. When the light bulbs heated up, bubbles would percolate in the tube. In the 1950s and ’60s, Christmas tree bulbs were flame-shaped and got hot to the touch. Finally, miniature lights were developed. You know Dasher and Dancer and Prancer and Vixen, Comet and Cupid, And Donder and Blitzen…but do you know the most famous reindeer of them all — Rudolph — was born in Chicago at the tail end of the Depression? Robert May was a 34-year-old copywriter for Montgomery Ward, the catalogue giant headquartered in Chicago. Not only was everyone praying to keep their job during the Depression, many, like May, had to face huge problems on the home front. In May’s case, his wife had cancer. Every year, the retailer filled their store Santa’s pack with a story book for him to hand out to children. In 1939, Robert May, himself sort of an outcast and object of ridicule because he was slight of stature, created a story about a foggy night that caused Santa to stop his deliveries midway through his worldwide flight. Un-like the song and the cartoon story we know today, May’s original story has Rudolph living with his parents in the woods. It was there he en-countered the cruel taunts of the other reindeer be-cause of his bright red shiny nose. But as fortune would have it, Santa got fogged in near Rudolph’s house. The bright red nose stood out. In a moment of brilliance Santa asked Rudolph if he’d lead the sleigh so he could make his deliveries that night. The Rudolph of the Great Depression who was born on the banks of the Chicago River in the Montgomery Ward building morphed into the charming little guy we’ve come to know and love every Christmastide. He was the product of a man who was frequently lonely, and a man who overcame it all with his God-given talents. There’s a touch of Christmas in all that, we’d say. Because Montgomery Ward employed Robert May, the character he created brought revenue by the thousands, not to him, but to the company. Many years later May asked Wards if they’d transfer the copyright and license to him as he was in dire financial straits. Wards gave May his Christmas gift, which in turn gave Robert May the financial independence he never dreamed possible. May credited his daughter Barbara, for naming the little reindeer, and she was his first critic and editor. The Rudolph plot got changed a bit in the Gene Autry musical hit. But even that was kept in the family. The song writer was Johnny Marks, Robert May’s brother-in-law. Needless to say, they both found Rudolph to be one of the best Christmas presents they ever gave themselves. Gene Autry did well by it too. It was the royalties from the song that allowed Gene to buy the Angels baseball team. Angels…see how this all fits together? Although a staple Christmas story for nearly two centuries, the full significance of Clement Moore’s poem is often forgotten. Published in 1822, “Twas the Night Before Christmas” crystalized for many what would become the widely understood depiction of Santa Claus. This particular incarnation would later be intertwined with the Euro-pean Father Christ- mas, creating the international figure we know today. In fact, Moore remained anonymous as the author at first, worried that the secular nature of the poem could cause controversy for his position as a Baptist Minister. Once the popularity of the poem was assured though, Moore’s name became known and he was forever famous as the man who designed a central part of our modern day Christmas. In writing this poem for his children, Moore drew upon his knowledge of anthropology and his fascination with ancient traditions at this time of the year. In weaving some of these traditions into his tale, many took on a new significance. There is a custom that on Christmas Eve an enormous log of freshly cut wood called the Yule log would be fetched and carried to the house with great ceremony. The master of the house would place it on the hearth, make libations by sprinkling the trunk with oil, salt and mulled wine and say suitable prayers. In some families, the young girls of the house lit the log with splinters from the preceding year which they had carefully tucked away. In other families, the mother had this privilege. It was said that the cinders of this log could protect the house from lightning and the malevolent powers of the devil. Choices about the variety of wood, the way in which it was lit and the length of time it took to burn constituted a genuine ritual which could vary from region to region. The custom, which dates back to the 12th century, was known in most Europeans countries, notably in France and in Italy. Its disappearance coincides with that of great hearths which were gradually replaced by cast-iron stoves. The great log was thus replaced by a smaller one, often embellished with candles and greenery, placed in the center of the table as a Christmas decoration. Today, the Yule log has become a traditional pastry, a delicious cake roll, smothered in coffee or chocolate-flavored icing and decorated with sugared holly leaves and roses. Who conceived of the idea of placing large snowballs on top of each other? According to old diaries and chronicles, this activity dates back to at least the Middle Ages, when in Europe every new snowfall would find townsfolk making snowmen in the streets. It is nearly impossible to build a snowman out of any type of snow other than packing snow. Packing snow is formed when regular powder snow comes near its melting point and becomes moist and compatible. This allows for the construction of large balls of snow by simply rolling a ball of snow until it grows the desired size. Attempting to make a snowman out of powdered snow is extremely difficult since it will not stick to itself. And if packing snow is not rolled into snowballs before it freezes, it will form an unusable denser form of powdered snow called “crust.” Thus the best time to build a snowman is usually in the next warmest afternoon directly following a snowfall with a sufficient amount of snow. Traditionally, a carrot is used for the nose, as are sticks for arms and lumps of coal for the eyes. (Buttons will do). Some like to dress their snowmen in clothing (scarves, jackets, hats). Introduced to the market in 1959 by the Aluminum Specialty Company of Manitowoc, Wisconsin, the aluminum Christmas tree soon became a staple in people’s homes at Christmastime. Aluminum trees had a unique, “modern” look that appealed to consumers during the advent of the Space Age. They were easy to set up and take down and they did not require the stringing of lights. Instead, lighting was provided separately by a rotating color wheel — a spotlight with three or four colored lenses that changed the color of the tree as the lens rotated in front of the light. The initial success of these trees in the marketplace encouraged other manufacturers to make them, as well. Soon, several dozen companies offered all sorts of aluminum Christmas trees for sale — tabletop versions, wall mounted, and free-standing in heights ranging from four to eight feet. Some had as few as two dozen branches; others had as many as 250! Not content to offer just silver-colored trees, manufacturers soon offered colored aluminum trees as well — green, blue, red, gold and even pink ones. The silver tree reigned supreme, however, and aluminum Christ- mas trees in col-ors other than silver are quite hard to find today. The pink ones are particularly rare; it is estimated that only one out of every 10,000 aluminum trees made were pink in color. Retro aluminum trees are a hot item on eBay these days. The word angel comes from the Greek word “angelos”, which means messenger. The Holy Bible says that God appointed many angels to those who love God and call to Him. Psalms 91:11 (For He will command His angels concerning you. To guard you in all your ways). The Bible says there are different types of angels, with varying duties. Some angels are guides, some protectors, and others are messengers of the Lord. The appearance and purposes of angels vary throughout history and the world. Artists have given us their visions of angels as winged creatures, usually beautiful figures that are seen as glowing, shining, or floating in human form. The site of The Angel Museum in Beloit, Wisconsin, houses over 12,000 angel artifacts from the Berg Angel Collection. It is documented by Guinness Book of World Records as being the world’s largest angel collection. It also has a gift shop. Copyright 2009 by Midwest Today. All rights reserved.